The ISI Group believes that more China stimulus is on the way, as the nation is facing a real slowdown. The measures taken so far have been relatively insignificant, particularly as a percentage of total GDP (chart below). 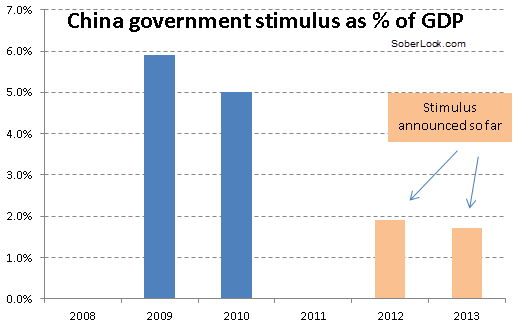 The difference this time vs. 2009-10 is that the central government wants to control the stimulus process as opposed to allowing regional governments to run with it. And the central government’s approach has been far more measured. Another reason further stimulus may be on the way is simply because the bank reserve ratio requirement (RRR) cuts – the most visible monetary action this year - have been ineffective due to low demand for loans.